Cut the head and tail from the fish and then wash them well. In a bowl, add water, salt and fish. Cover the bowl and cook on medium flame for 30 minutes. In a pan, add 2tbsp oil and fry the fish head and tail until golden. Set aside. Fry the breadcrumbs until just brown in color. Now remove the bones from the boiled fish. Add mashed potato, 1/4 cup breadcrumbs, fried onion, tomato ketchup, lemon juice, lemon zest, chopped green chilies and coriander leaves, salt, sugar with mashed fish. Then mix this mixture. Heat ghee in a frying pan and place this fish mixture over the pan. Keep stirring and fry them until golden brown. 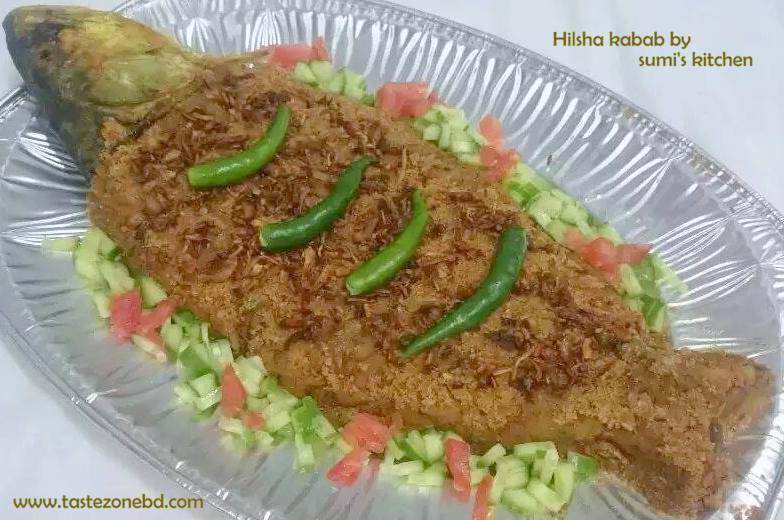 Now in a big tray place the head and tail of hilsha fish and place the kabab in a fish looking shape. Spread remaining breadcrumbs over the fish kabab. Delicious hilsha fish kabab is ready….